The hairy-eared dwarf lemur is said to be the rarest of all lemurs. 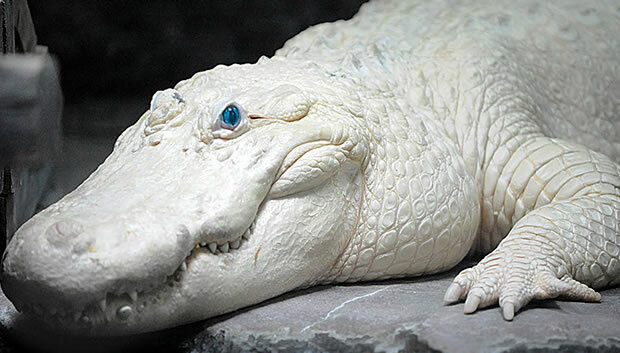 This species probably never existed in high numbers, and it was believed to be extinct until rediscovered in 1989 in the vicinity of the Mananara River in northeastern Madagascar. The average head and body length of adults is 5.31 inches, and they can only weigh up to 100 grams. Its fur is brownish gray in color with whitish gray underparts, and it has a reddish brown tail. The ears are short and possess tufts of long hair in front and on the internal side of the lobe, giving the species its common name. This species seems to prefer lowland primary rain forests for its habitat. It also appears to be nocturnal and arboreal (preferring to remain in the trees). To rest, the lemurs sleep in holes of large trees, and it is reported that they also hibernate in the trees or underground from May to September. These lemurs seem to prefer to remain in pairs, and groups with as many as three pairs have been observed. It is not known what the hairy-eared dwarf lemur eats in the wild, but it is believed that they eat nectar like other lemur species. Some captive hairy-eared dwarf lemurs enjoy feeding on locusts. Males and females may mate and remain together for life, and the female may give birth to only one young. 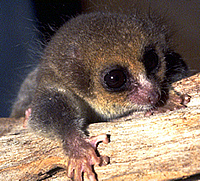 Threats to the hairy-eared dwarf lemur include loss of habitat due to deforestation for agriculture and logging. Also these lemurs are sometimes caught in traps and eaten by locals. Individuals are hard to locate, which makes the conservation status of the species difficult to assess, but there are plans by the Malagasy government to protect its remaining habitat. Copyright Notice: This article is licensed under the GNU Free Documentation License. It uses material from the Wikipedia article "Hairy-eared dwarf lemur". Glenn, C. R. 2006. "Earth's Endangered Creatures - Hairy-eared Dwarf Lemur Facts" (Online). Accessed 4/23/2019 at http://earthsendangered.com/profile.asp?sp=967&ID=1. Need more Hairy-eared Dwarf Lemur facts?